There is no such thing as too many bags, wouldn't you agree? My friend Laura P. seems to as well! 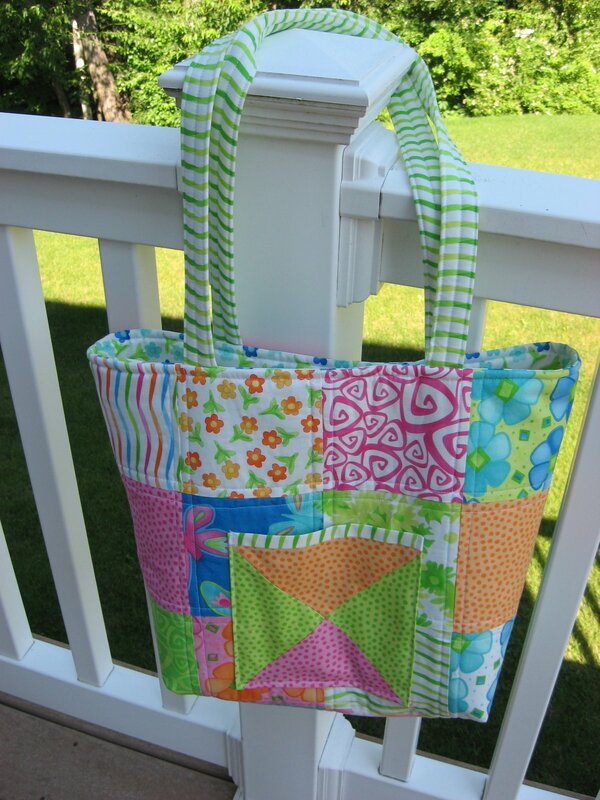 Take a look at the quilted tote bag she ordered recently. It is so her! 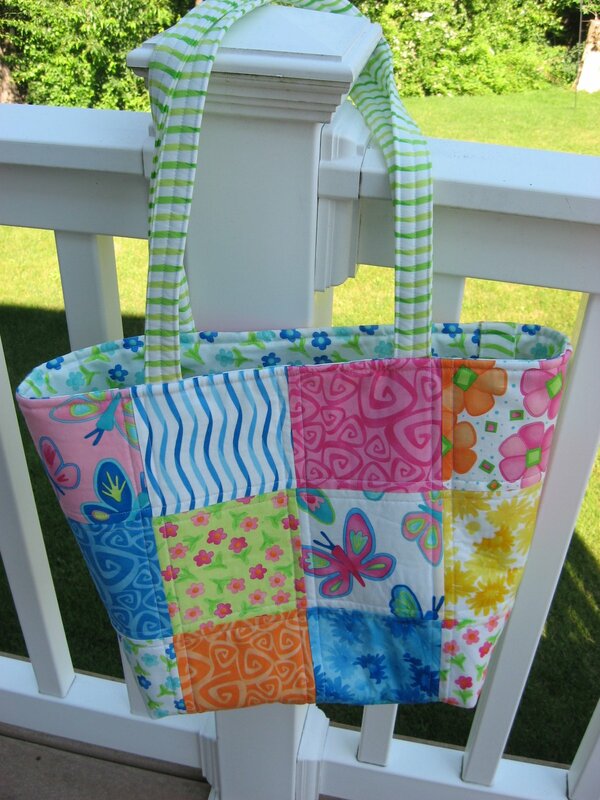 The outside of the bag was made with a charm pack of Twirl by Me and My Sisters Designs for Moda. Have you ever seen happier fabric? I just loved working with it! This is the other side of the bag with no pocket, but just as happy! How about that lining fabric? 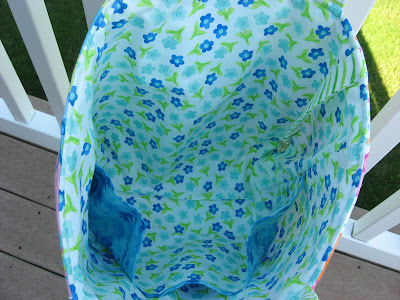 I just might have to hunt down a couple yards of that gorgeous fabric to make my little Gracie a summer dress. Yum! 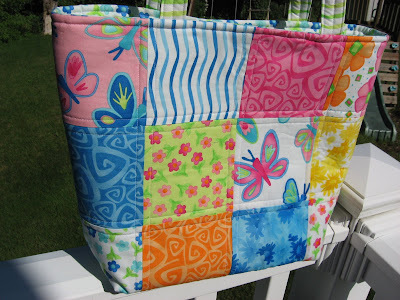 Do you change bags frequently, or use one until it falls apart? I'm more of a Use One Until It Falls Apart kind of person, and my current bag is in desperate need of a replacement. I hope to accomplish that next week! 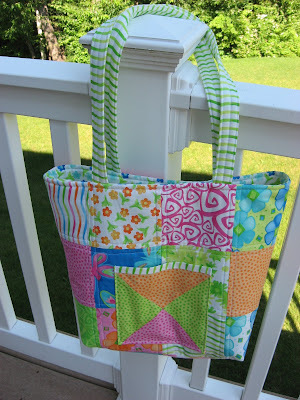 And after looking at the pictures in the post I did over a year ago for that bag, I simply must make a new one very soon! I didn't realize just how bad it was until just now! Ugh! Our two youngest children completed their 4th grade and 2nd grade school years today, so we are officially on Summer Vacation now. Grace has picked up crocheting and is becoming quite an expert at chain stitch, and Sean began his next latch hook project which is a Very Large Macaw parrot in gorgeous colors. Hopefully they will stay interested in their projects for a while each day so I can get some of mine done too! Wow I love that bag - the lining would certainly make a lovely dress for Grace. I can see that Sean and Grace are following in your footsteps - crochet and latch hook should keep the both busy for many hours. Happy Summer!! Cute bag, can't wait to see yours. What a blessing that bothe of our kids enjoy crafting!